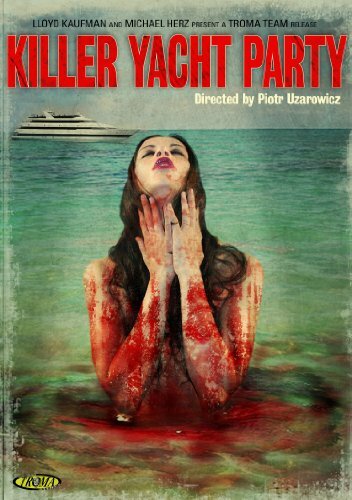 Just as “Jaws” and shark terror nearly drove sharks to extinction, the latest release from Troma Entertainment, “Killer Yacht Party,” is so terrifying it could mean the end of the entire yacht industry! This film is so frightening that it will make you think twice about ever setting foot on a boat again! In fact, you will be so frightened that you may never even swim again. You will be so disturbed after watching “Killer Yacht Party” you will never drink water again! If you thought “Insidious” was frightening, if you thought “Paranormal Activity” was disturbing, then prepare to drown in your own terror with “Killer Yacht Party,” the party where your organs are the party favors! The feature debut of director Piotr Uzarowicz and writer Alex Silver, and starring True Blood’s Kate Luyben, “Killer Yacht Party” tells the gory story of two LA club promoters, Brock and Monica who decide to host a party on their new yacht. However, they get more than they bargained for when guests at their killer party begin meeting brutal and bloody ends! Hitting the streets on May 10th, 2011, the DVD comes fully loaded with special features, including the trailer and director’s commentary track.